← Chester VA Real Estate: #1 Reason To Buy Chester VA Homes For Sale TODAY! Looking for homes in the Chesterfield county real estate market? 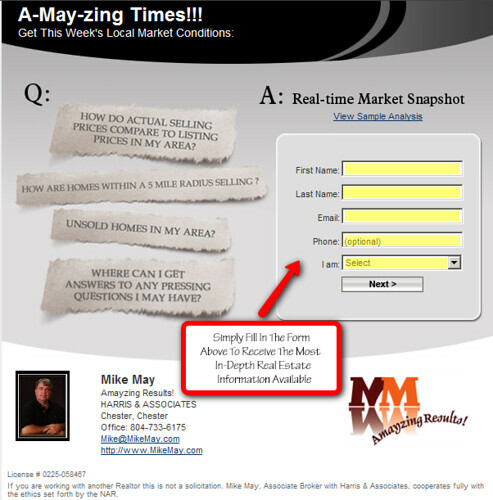 No matter where you are in the home buying and selling processes, this is the one tool you must have to be as informed as any Realtor â€“ the Market Snapshot. Keeping yourself highly informed of the market statistics and temperature on an on-going basis is truly imperative now more than ever. Knowing the direction the real estate market is heading and has been is the greatest source of information you can have at your fingertips and this is exactly what the Market Snapshot tool will give you. The school information pages will provide you with a comparison of school information within a radius of 1-10 miles of your specified search area, both public and private. To obtain access to this invaluable tool, please click the link below and you'll be on your way.